Traditionally the first sarong worn by a girl, èi lèko wue, literally the-sarong-that-hinders- the-body, does not display ikat motifs or red colour. It comprises bands of white and blue according to the moiety identification. 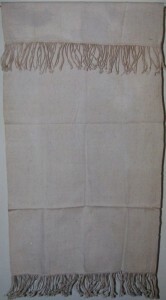 The lack of ikat patterns confers the name èi wopudi or white sarong. In fact here pudi means blank (‘polos‘, ‘kosong‘, Indonesian). A girl was entitled to ikat patterns and red colour after puberty. Two girls of hubi ae, Mesara, wearing èi lèko wue (or èi wopudi). 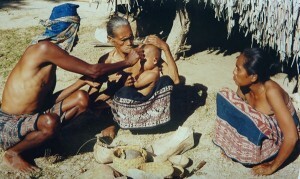 A child is introduced to its first sarong or selimut during a d’ab’a ceremony (‘traditional baptism’) between the ages of three and six. The first hip-cloth worn by a boy is known as hi’i lèko wue or hi’i wopudi. Hi’i lèko wue means ‘the blanket-that-hinders-the-body’, since before that time a boy did not wear a cloth around his hip, thus feeling more free. It may be called as well hi’i wopudi meaning the ‘white’ or ‘blank’ hipcloth (selimut, Indonesian). This does not necessarily mean that the cloth is indeed white, but that it does not show ikat patterns (as for the girl’s sarong); it is blank, (‘polos‘, Indonesian). According to several informants, when a boy after puberty was introduced to an adult-size ‘selimut’ with ikat motifs, he wore his first ‘selimut’ as a head-cloth.